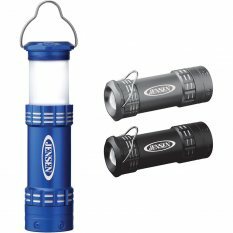 "Advertise your brand name or logo with this personalized Albin Lantern Flashlight. It is Single white LED light with 3 functions (low output, high output, and flashing light). To use as lantern, twist and extend. Hook allows you to hang or carry. Some other features are: Colours: Black, Gunmetal and Royal Blue Item Size: 102mm(h) Materials: Aluminum Decoration Type/Area: Pad Print: 38mm(w) x 12.5mm(h) Laser Engraving: 38mm(w) x 12.5mm(h) Item Packaging: Bulk Packed Shipping Packaging: 60 per carton, 6.9 kgs, 33.1 x 28 x 28cms Lead time: 5-14 Days Minimum Order Quantity: 100"